We are no longer selling display cases. Please see yoshinumber2 on ebay for your acrylic case needs. 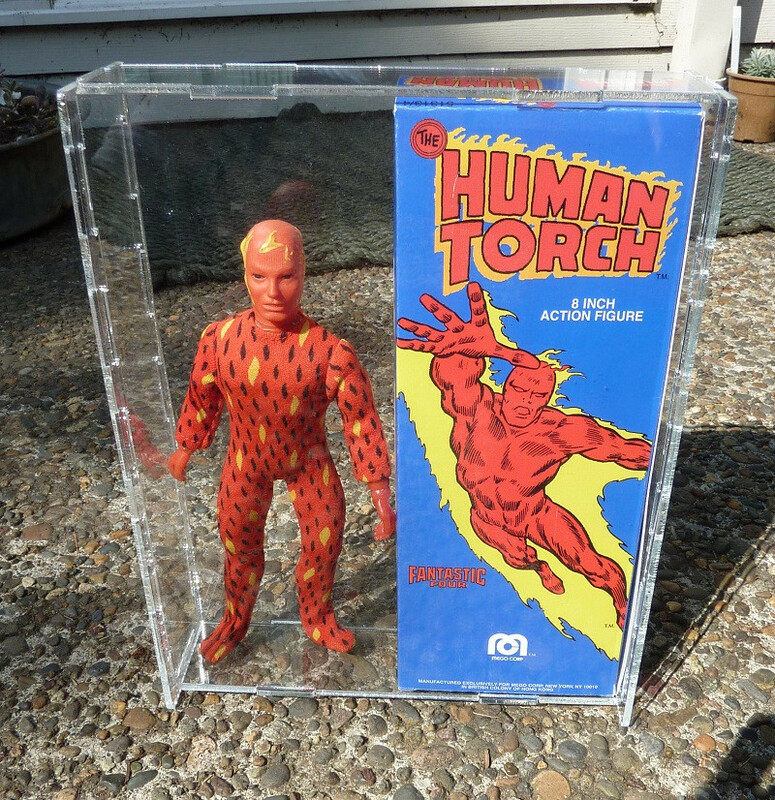 He was at Mego Meet 2017 and is a super nice guy. 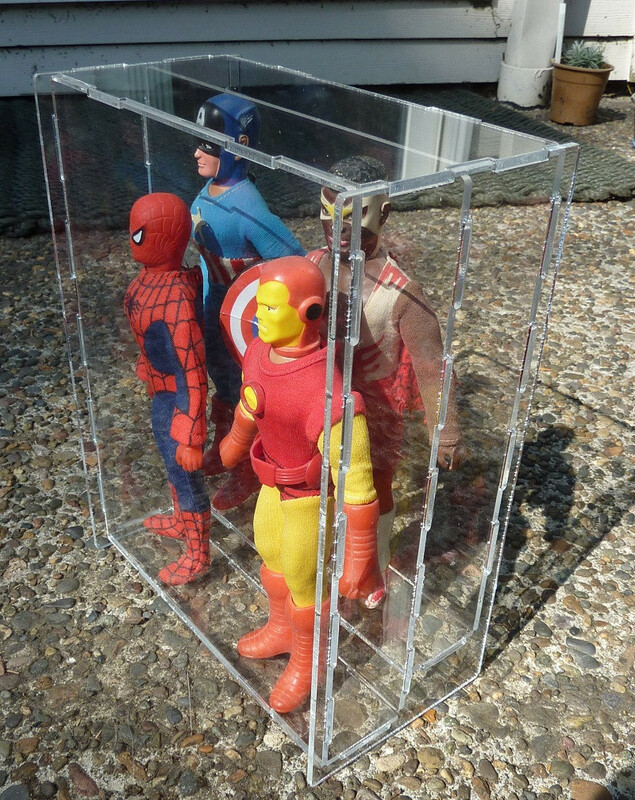 Now available, acrylic display cases for your boxed and loose 8" Mego action figures! 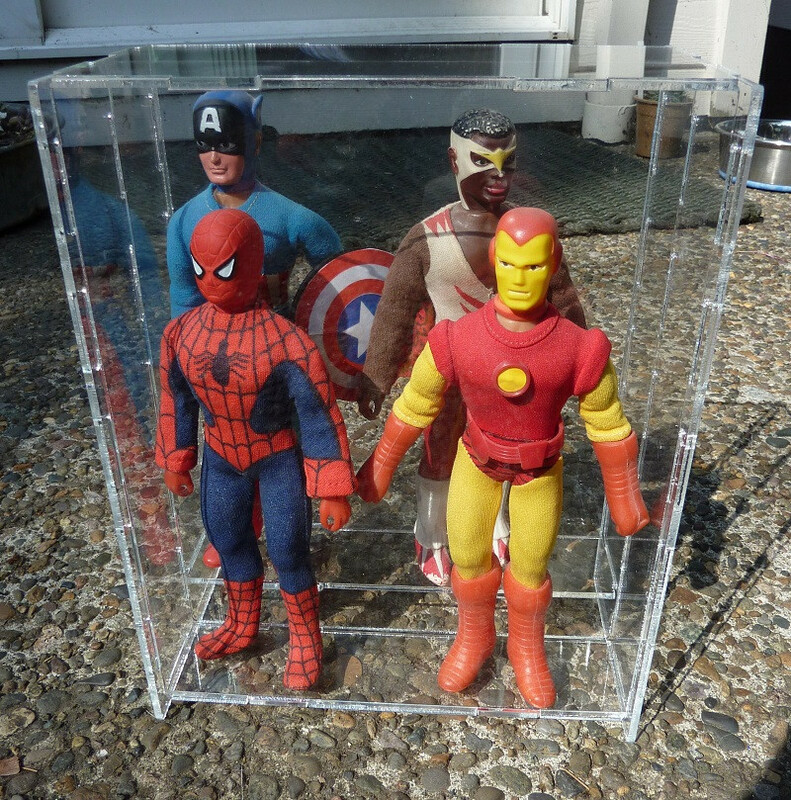 They are made of 1/8" clear acrylic plastic that is cut with rounded edges and a hole-and-slot snap together constructions. 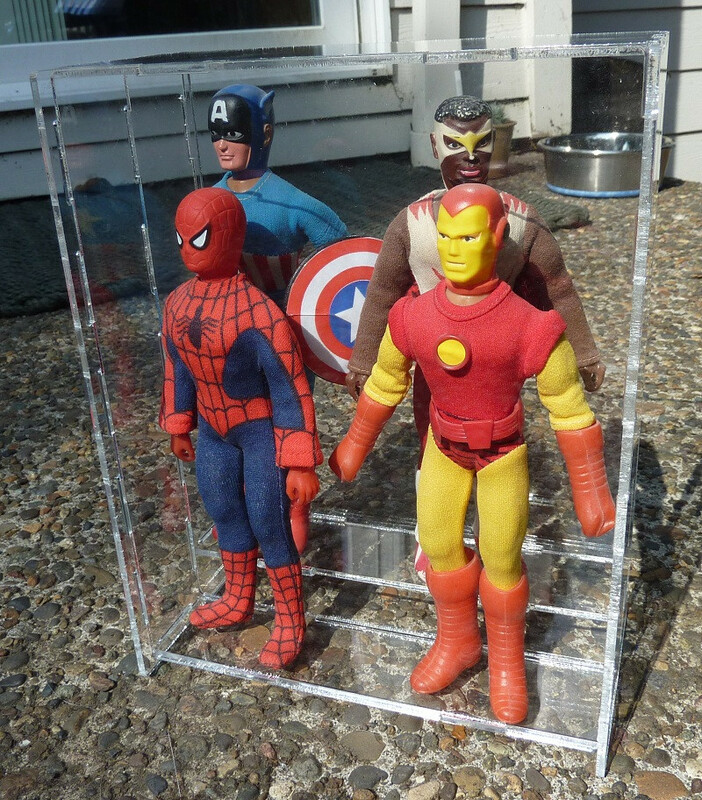 They are packed flat for easy shipping and are simple to put together. The top is on loose to be easily removed to re-position a figure. They come in four different sizes: single, double and quad. 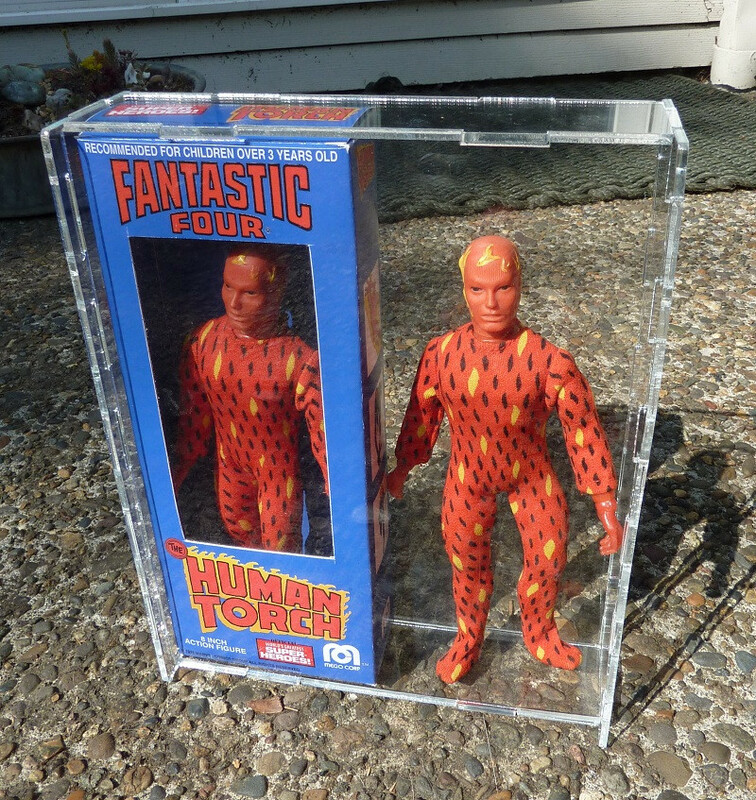 Please check the inside dimensions before ordering to make sure your boxed figures will fit. We can also do custom sized cases. Note that the figures and boxes shown are not included. 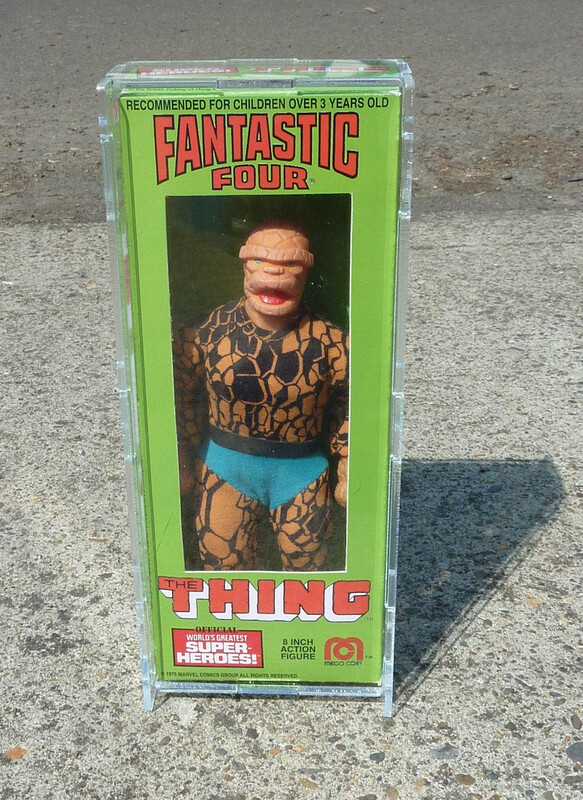 The single has an inside dimensions of 3 3/4" wide, 1 5/8" deep and 9 3/8" tall, just right for a boxed or loose Mego figure. Outside dimensions of 4" x 2 3/8" x 9 7/8". This item has been retired and is no longer available. 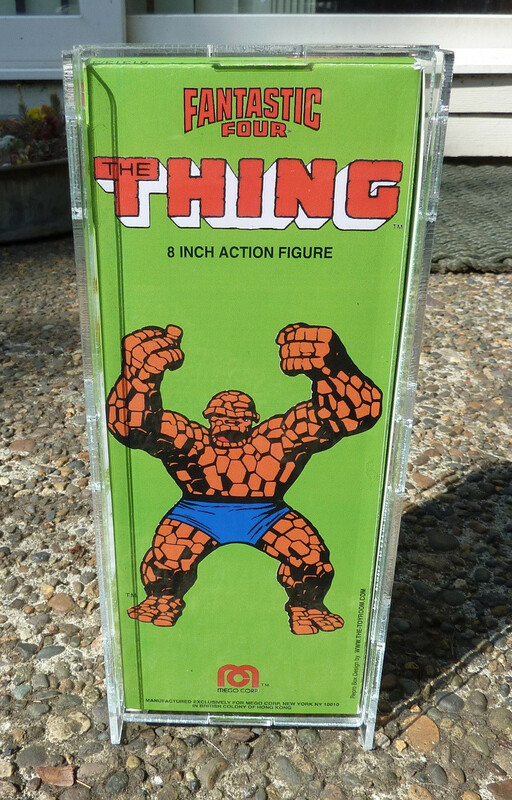 The double has an inside dimensions of 7 1/2" wide, 1 5/8" deep and 9 3/8" tall, just right for a 2 boxed or 2 loose or 1 boxed and 1 loose Mego figure. Outside dimensions of 7 3/4" x 2 3/8" x 9 7/8". Nice way to display a boxed and loose example together. The quad has two inside compartments with the back one 1" above the front one. 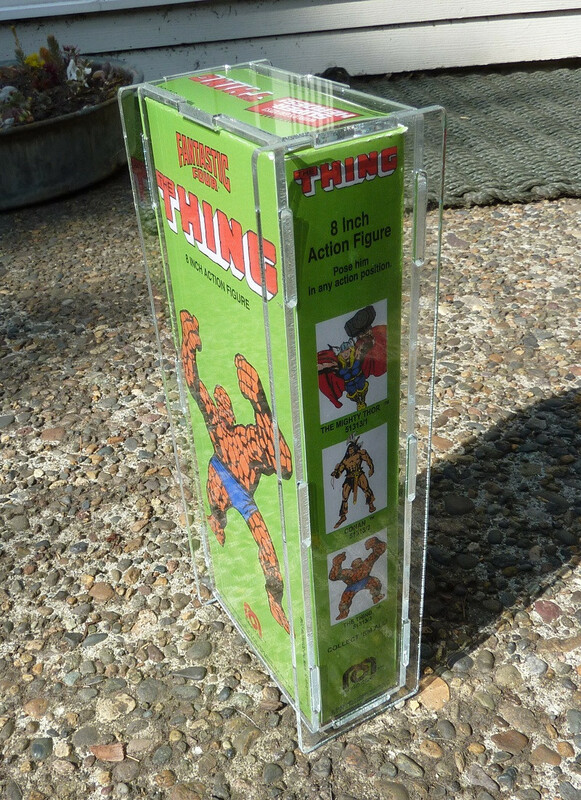 A great way to display 4 loose figures, but not recommended for boxed figures as the boxes won't fit in the back, and will block of the view of the back figures if put in the front. The front compartment has inside dimensions of 7 1/2" wide, 1 5/8" deep and 9 3/8" tall and the back compartment has inside dimensions of 7 1/2" wide, 1 5/8" deep and 8 3/8" tall. Outside dimensions of 7 3/4" x 4 1/8" x 9 7/8".